"On the Originality of Schumann, Part 2"
One of the truly great Schumann pianists (and conductors) of our time is Christian Zacharias. When I first started the Schumann Forum 2010 in January I already fostered the desire to have the opportunity to question him on Schumann and to publish his answers online for you. In the summer, in between his rehearsal times for the “Schubertiade” in Schwarzenberg (Austria) I actually got my chance. We sat together at the edge of a lovely green meadow, the birds in the trees were giving a natural symphony (their song is heard in the background on the recording of the interview) and Maestro Zacharias was in the best of moods for a chat. I am especially honoured to post the interview with Christian Zacharias on the Schumann Forum, because it gives the G. Henle Verlag the added opportunity to officially congratulate Maestro Zacharias on his 60th birthday which he celebrated in the spring of this year. To what great extent Christian Zacharias centres his interest on the music of Robert Schumann is not only made evident through his countless Schumann concerts and numerous Schumann recordings, but also through his contribution to the 1989 French-language film production “Robert Schumann – Le poète parle”. My questions to Christian Zacharias were more or less the same ones that determined my rich discussion with András Schiff (ref. preceding entry from 1. October). The essence of our talk was to define what makes Schumann’s (piano) music so unique and original, to pinpoint what makes his music so unmistakeably “Schmannesque”. Maestro Zacharias’ thoughts are equally as insightful as András Schiff’s and reflect an unbelievably thorough and deep knowledge of Schumann’s oeuvre. Perhaps he voices more criticism than András Schiff (for example his opinion of “Papillons” op. 2 is that they are not consistently perfect, whereas Schiff notably regards them as Schumann’s key work), but after an hour of talk about Schumann it was clear to me that I was conversing with a true Schumann enthusiast like no other; Zacharias is from the core of his being devoted to Schumann. Dear readers, the interview is posted here exclusively for you. I summarized an abstract of the conversation in writing (in German and English) and have put together the key moments of our talk. Before I had even unpacked my notes and questions on Schumann Maestro Zacharias himself immediately remarked on Schumann’s metronome markings and the value of finding them reliably researched and printed in the Urtext editions, and his conviction that they need to be taken seriously and heeded by all musicians. 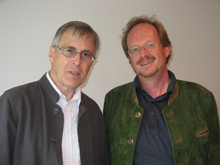 He especially praised my article on the metronome markings that was posted on the Schumann Forum 2010 on 15. July (the article also contains a practical list all of Schumann’s authentic metronome markings). Because Henle recently published an Urtext edition of Schumann’s Piano Concerto (see 1. February and 15. February) Maestro Zacharias was prompted to comment on this piece first, especially because this masterpiece is misunderstood or rather misinterpreted by many pianists in regards to tempo and measure. Listen here to what Christian Zacharias says (and sings) about his early approaches, many years ago, to follow the correct metronome instructions against all - distorting - tradition. By the way, the booklet by Bruno Walter that Maestro Zacharias mentions at this point is “Von der Musik und vom Musizieren” and was published by S. Fischer. It is out of print now, but is available through several antique book sellers, and much worth reading. We quickly reached the essential question, namely what is so incredibly unique about Schumann’s piano texture, and why his music is at times confronted with the complaint of being unwieldy. Zacharias spontaneous answer is astounding and he not only refers to Chopin and Liszt, but also (as a conductor) draws a comparison to the way Schumann structures his orchestral works. In the following course of this rich conversation Maestro Zacharias proved to be a truly profound connoisseur of Schumann’s entire oeuvre. He drew parallels throughout many genres and biographical stations in Schumann’s life, referred to individual passages in Schumann’s works and highlighted them – I was hardly able to follow. Again and again it was evident that he does not at all attribute the rank of a masterpiece to everything that Schumann wrote. Especially the late works he is inclined to view critically (quite in opposition to András Schiff). And because Christian Zacharias especially uses the “Papillons” op. 2 as an example, I would like to provide the link to the new Henle edition for further reference. If you have the copy you will be able to study in “Urtext” the last passage of this work which is possibly unique in the history of music, indeed. From the hour-long talk I endeavoured to distil the answers to my usual questionnaire on Chopin and Schumann and summarize them for you, dear readers. Read here Christian Zacharias’ comments on the nine queries that, by now, are certainly quite familiar to you. At this point of reading and listening you will want to experience Zacharias and Schumann together. I can only encourage you to go to a live concert. If you don’t have that opportunity then at least I can point you to some recordings; I personally think that Zacharias’ recording of the Piano Concerto is among the best ever (see also “Schumann Forum 2010”, 15. February). And I would like to recommend the Piano Box released by EMI for the anniversary. It contains a wonderful collection of recordings of the greatest Schumann pianists. From the set you will now be especially interested in Christian Zacharias’ interpretation of “Papillons” op. 2, “Davidsbündler-Tänze” op. 6 and “Kinderszenen” op. 15. For more immediate enjoyment I would like to lead you to a live recording of the “Fantasiestücke” op. 12 on YouTube. Admittedly it is already 20 years old (recorded in 1990 at a festival in France), but who would not admire and be enraptured by the unfaltering, exquisitely poised and masterly touch of Christian Zacharias. Dear Schumann enthusiasts, I look forward to welcoming you on the Schumann Forum 2010 on 1. November with Schumann news from Shanghai (China).